I wrote about Michael “Wile E. Coyote” Winters’ ACME-powered reaction HERE. His sputterings confirm it as a good buy. Rex does a bit more than review the book. He offers some strong commentary of his own about what’s going on in the Church today and what Pope Francis is doing about it. It is beyond question that the Roman Catholic Church is currently in the throes of one of the greatest crises in its two-millennium history. In human terms, its future might be said to be in doubt for the first time since the Reformation. The broad contours of the present crisis are the onward march of secularization in Europe and North America, the purging of Christians from the ancient heartlands of the Middle East, and the erosion of South American Catholicism by the missions of the Protestant and prosperity gospels. More specifically, the horrific and continuing revelations of the sexual and physical abuse of the vulnerable by the clergy, and of the failure of the institutional Church to identify and address the issue, have in some places turned a Catholic retreat into a rout. The dramatic and utterly unforeseen collapse of Catholicism in Ireland in little more than a generation, for example, harks back to the tectonic religious shifts of the early sixteenth century. Only in Africa is there much by way of good news, and it is not always clear how good that news is. In the face of this crisis, Pope Francis is seeking a rapprochement between the ideals of Catholicism and the realities of contemporary social norms by some softening of the traditionally hard lines of Catholic sexual and matrimonial morality. I recommend the First Things piece and Douthat’s book. 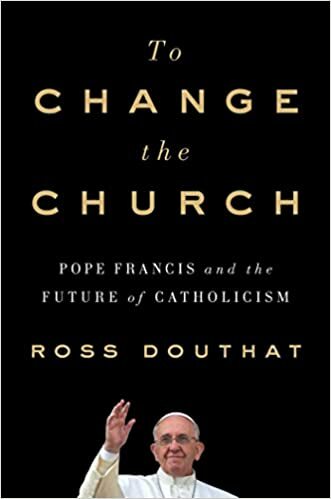 This entry was posted in Pope Francis, REVIEWS, The Coming Storm, The Drill, The future and our choices and tagged Pope Francis, Richard Rex, Ross Douthat. Bookmark the permalink. Changes, in the Church? Not anything that truly matters. Not anymore. I can’t imagine any of this retaining any traction after the facts of this papacy come to light. It is remarkable to me how quickly the innovators and lefties embrace wholesale changes that fly in their particular direction and attach earth-shattering importance to them, but equally deplore any effort for the Catholic Church to remain, um, Catholic. If they want that much to change, why are they here in the first place? Seems to me all those changes took place in the 17th century or so, and the results are somewhat mediocre. If they wish to be protestant, then why aren’t they Protestant? Tramranthor- I agree with you. An Eastern Orthodox friend and I were having a discussion about Francis – she was scratching her head as to how the Bishop of Rome could deny dogmas that both the Western and Eastern branches of Christianity share. Could he have written: “….some radical changing of Jesus’s two thousand year old commands for his followers”? “Let us beset the just one, because he is obnoxious to us; he sets himself against our doings, Reproaches us for transgressions of the law and charges us with violations of our training. In other words, it’s not enough that they should go their own way and leave the faithful to go theirs; they must rid themselves of the example of the faithful so that that example is no longer a rebuke to themselves. For a man can live content – for some time – doing what he knows to be wrong. But no one can live content doing wrong, and calling it right, while living side-by-side with other men who are doing only what is right and leading happy lives. Mr. Rex saved his best point for last. If the Church can eliminate Her teaching on the indissolubility of marriage after 2000 years, She has tormented countless people along the way for no reason, and can no longer claim to be even as merciful as other religions or even secular society. How can the church claim any credibility from here on in, with this being the case. The Church was the holdout. Having the claim of holders of the truth was what made Catholicism stand out from the world. Now Western culture and the world is flying apart at the seams because the Church has stopped teaching Truth and is instead promoting fables. Wait. The Church hasn’t changed its teachings. It won’t. Let’s be mindful of the fact there are those who are working hard at spreading disinformation. But there may schismatic parishes and priests. But they don’t define The Church. It behooves us to know the whole teaching of the Church for the last 2000 years. And not just what is currently in the news. If we just focus on everything after Vatican II we won’t get a complete picture. It is a serious crisis, but in the end Truth will prevail. Conservative Catholics, however, likewise need to be careful. They may fear that the pope might undermine fundamental doctrine on marriage. But some seem almost to relish the prospect. Problem is, it just isn’t valid. Oh, of COURSE it is valid that conservative Catholics should not relish the fact that the Pope is a wildcat attempting to do something that would wreck the Church. But there is no appreciable body of conservative Catholics who are doing that. The few individuals who might be said to fall into that error could be easily rounded up in a small stadium with plenty of room left over. Rex is simply misunderstanding the delight he is hearing on the conservative side of things. The problem is this: thinking and careful conservatives have been warning of these problems for DECADES. Unthinking conservatives, knee-jerk conservatives, and middle-of-the-roaders have been ignoring the concern as being unimportant. Now that Francis is making everyone sit up and notice just how bad the problem is, (i.e. forcing the unthinking conservatives and the middle-of-the-roaders to admit there is a crisis), now the thinking conservatives feel a great sigh of relief that the others have FINALLY noticed: See? SEE! We told you there was a storm brewing! Now that it is upon us, we can all admit the reality. This great response of relief at being vindicated does also come off, in a few careless and extreme cases, as if conservatives were GLAD of the crisis. But that’s really just a seeming. They are glad rather of eyes being open, the truth coming out into daylight. Where, possibly, the pustule can be lanced and the infection eradicated – if we are fortunate. There are a tiny minority – just a pittance of the tiny fraction of Catholics who are sede vacantists – who have been so soured by Church failures for over 50 years that they are now actually relishing the crisis itself. Even these are primarily hoping that they will somehow be vindicated by seeing Francis actually ousted from the Vatican and the chair of Peter, with a new true pope who is more in the mold of Pius IX. They are not relishing that Francis “undermine fundamental doctrine on marriage”, but relishing the fight which might rid the Church of the Francis Project for good. Again, the degree of “fractiousness” and complacency, “redolent of fissile sectarianism, rugged individualism,” etc, is not really all that. Except in the (again) teeny tiny minority, (a minority so small that bishops routinely ignore it COMPLETELY), these are not the errors of conservatives. And even in that tiny minority who are infected with fissile sectarianism, the ills are almost wholly the normal pathologies that come when those in authority, on whom ordinary faithful should be able to rely for leadership and guidance, have routinely MISled and BADLY guided. In the ordinary conservative, though, where there is a false and un-Catholic seeming “rugged individualism”, it isn’t really that very much: it is merely a reflection of the liberal wanton individualism of a liberal society, reflected imperfectly and without sufficient guidance into true virtuous subordination to God and responsibility to men: the conservative knows that the wanton individualism of Justice Anthony Kennedy (for whom every man makes up his own idea of good), and knows to pull back from it, but does not know how much or in what way, and manfully attempts to find his own way (since so many of the bishops and priests are out to lunch). Last comment: Rex says Conditional access to Communion for the divorced and remarried might seem to them merely a question of ecclesiastical discipline. What the liberal Catholics don’t recognize is that if liberal western societies get what the TRUE liberals want, “access to Communion” will be restricted for EVERYONE, because the Church will be oppressed and hounded into near oblivion. There will be very few priests, and they will have no permanent church buildings from which to form parishes, and the faithful will be a remnant virtually in hiding. Religious freedom is being attacked on so many sides by the liberal stupidigentsia that if they get their way, there will be no tax deduction for giving to the Church, no Catholic schools that don’t teach in favor of gay marriage, no priests given the right to hear marriage vows if they won’t hear them for gays, and on and on and on. Try getting regular access to Communion THEN. Good luck. Aquinas Gal – truth does prevail, but in the interim we are talking about a billion souls being led astray. I saw this article earlier. I disagree that it’s a good article. There is much truth that is concealed and must that is false that is brought front and center. The article is quite simple. We have a manufactured crisis and the solution to fix the crisis is dramatic change. We must first accept the premise that the Church is in crisis AND that the solution is to abandon what the Church has always taught. But what if the crisis is not so broad and deep as has been supposed? Would the medicine be needed if the illness were not as serious as was once thought?